PAGACH Recipe – A.K.A. Hunky Pizza! I have never made the following recipe, however it sounded very tempting! If anyone attempts this wonderful dish, let us know how it turns out! 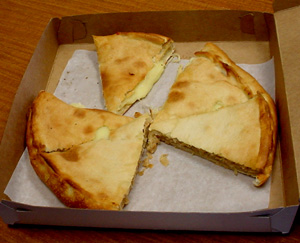 Pagach is a Slavic dish that can be served as a side item like bread or as a main meal. Grandma made Pagach as our Friday supper since it contained no meat. She served it dripping with melted butter. Pagach is mashed potato-stuffed bread. It can be rolled out round or rectangle. Do not whip or add additional liquid to the potatoes or the pagach will puff up like a pillow in the oven. Saute cabbage in butter until soft. Fry sauerkraut slowly in butter about 5 minutes. yeast which has been dissolved in water. Add about half the flour. Beat well. This entry was posted in Food and Restaurants. Bookmark the permalink. 30 Responses to PAGACH Recipe – A.K.A. Hunky Pizza! Christmas Eve and noticed the picture of that sweet grandma who looks so much like my grandma I had to stop and look more closely. I’m really looking for a recipe that she made that had bread rolled into balls (meatball size) then covered in poppyseed. I think she cooked the poppyseed in a little bit of milk before rolling the bread balls. If anyone has that recipe I’d love to have it! 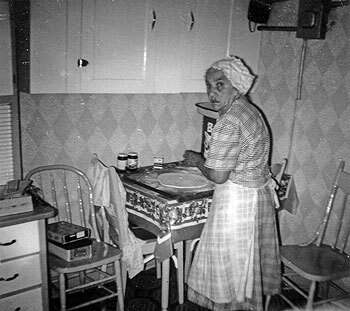 If we had time travel the first place I’d go is back to my grandmothers kitchen! Hi Colleen the recipe you are looking for is called bobalki. If you give me your email, I’ll send you the recipe I use. When I was 5 years old our neighbor was Slovic . She made delicious home made bread. She also made Pagach. I have hunted for years to fine a recipe and no one ever heard of pagach. Now I have one. Her name was Vernie and she lived in a little town of Byesville, Ohio. The potato and cheese were my favorite. Also I remember the nut rolls they sold at the church bake sale. My grandmother was able to get the recipe for those. Nut rolls became a tradition at our house during the holidays. What a story….because it is exactly the same as mine. I searched thru recipe boxes, online, trial & error recipes until I found the one that works. My Dad used to brush with melted butter and salt it…breakfast with a cup of coffee. Yummy! Just getting ready to make this year’s Christmas batch. Oh and the nut roll “cookies” were to die for. Brings back fond memories. Thanks for your reply. I also remember the nut rolls that have been a tradition every year at Christmas. They are delicious! Bob, How do you make the NUT ROLL COOKIES? Sound delicious!! My Grandmother always made the Pagach filling with sauerkraut and golden raisins fried together in butter. It’s the one thing I cannot ever stop making for Christmas and Easter. She called it Kapusta pie. I didn’t learn the correct terminology until way after she passed away. So good even my 18 month old granddaughter likes it! My Grandma and Mom used to make this. But they would mix the mashed potatoes with Longhorn or mild cheddar cheese and use it as a filling. 🙂 OMG It was soooooooo Delicious! Hi, I grew up in Clairton not far from Duquesne. My mother always made the paguch but never would let us help, hence the recipe went with her also the technique. I am hosting the Christmas dinner this year and attempting to make the paguch, I hope I will do her proud. Get the recipe soon as PG links often drop out after a few days..
Just FYI, the link still works, if anyone needs it. Forty-fifty years ago Mom made an “egg gravy” to dip the pagach in – anyone have any ideas how it was made or could be made? LOVED reading all of the comments. Was raised in Johnstown in a totally ethnic neighborhood, Minersville.. We had seven or eight Catholic schools “over the bridge” in Cambria City. Each church represented a different ethnic group. My family attended St. Steven’s (Slovak) and there was St. Casimir’s (Polish), Immaculate Conception (German), St. Columba (Irish), St. Rochus, (Serbian), St. Mary’s (Greek Catholic). The churches and schools were built by the nickels and dimes of the coal miners and steel workers. And of course, all of our families made the delicious ethnic foods. In fact, there is an annual folk fest where tons of stuffed cabbage, pierogies, nut and poppy seed rolls, etc. are sold. Since the town is sorely in need of jobs, I’ve often thought of how great it would be to have the ladies start up a Hunky Heaven mail order business. I’ve seen nut rolls on the internet going for $31. Wow. Made three sirecs yesteday and my wife made two loaves of pascha bread today. We have our ham and kielbasa, dyed eggs and horseradish. !ust sorry we didn’t have time to prepare our Easter basket and have it blessed. It’s great to know there are many people out their keeping these traditional foods still relevant today. My sirec is a simple recipe with just the eggs and milk with a dash of salt and sugar. As for the comments on pagach, I recall the full name as pagachi, my dad’s nickname as a boy was pagach because he loved the food. His grandmother would make it in their coal stove. My family is originally from Wilkes-Barre. Love this recipe as it reads like my moms Slovak cookbook dated 1962, the year I was born. I remember having pagach at my aunts hose as a child……gonna make this fir my family this easter and serve with my baked ham, coming from Ashley, pa…..and keeping the tradition. my mother in law did the same thing at Easter she used a new knee high and put Easter cheese in it. It looked like a big yellow Easter egg. Great memories!!! I’m trying to contact the family of Joseph Tomovcsik who lived in Duquesne about 1947. Would that be you? My ancestor Ruby Patricia Jeanne Emerson nee Oliver is somehow connected. My grandmother used to make potato pagach, She used to put a seasoning in the potatoes. She had brought the plant over from Slovakia many years ago. The plant died and we only have a small jar left of the dried seasoning. Does anyone know what this seasoning could be? The recipes you have shared with your readers are just wonderful. I asked a friend of mine who is of Eastern European origin, Have you ever heard of egg cheese? She lit up and said, Oh yes! I heard about how her grandmother used to make it. I marvel at how grandmas and mothers in the past could make the most tasty items- like pagach- out of humble, frugal ingredients. Sometimes the best tasting things are made at home by the people who loved us best. Does anyone have a recipe for Sirecz? If someone does polease send it to me at cgallucci@verizon.net. My Slovak grandmother use to make it and I really like it but haven’t been able to find a recipe. Hi Cathy. Jim has answered your prayers! Read Slovak Easter Cheese. Oh, God it was good! !